What It’s About: “Steamboat Bill” Canfield (Ernest Torrence) is a tough man whose steamboat business rests on the fact that he is the only game in town, despite his (and his steamboat’s) unpolished appearance and no-nonsense attitude. 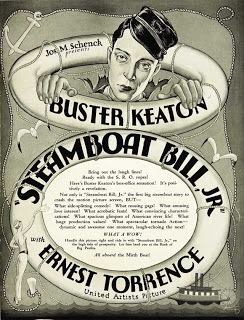 When J.J. King (Tom McGuire), the town’s banker, decides to add one more business venture to his portfolio by starting his own, modern, high-class steamboat company, Steamboat Bill knows he’s in for a fight. Compounding his troubles is the arrival of his son, William Canfield, Jr. (Buster Keaton), a foppish college grad who hasn’t seen Steamboat Bill since he was a child and who has never worked a day in his life. Add in a budding romance between Junior and King’s daughter Kitty (Marion Byron, Trouble in Paradise) and a cyclone, and you’ve got the makings for a lot of trouble for Steamboat Bill. Why Watch it Today? : Buster Keaton was born on this date in 1895. Steamboat Bill, Jr. was Buster Keaton’s last comedy before he stopped producing his own movies and signed a contract with MGM. Read my original review here. This entry was posted in Black and White, Comedy, Disaster, Fish-Out-of-Water, Independent, Silent, Slapstick and tagged boat, Buster Keaton, class issues, college boy, cyclone, father-daughter relationship, father-son relationship, jail, meet cute, overbearing father, prison break, river, shopping for clothes, steamboat, storm.